Oil on panel, 57 x 49,5 cm. The Virgin Mary’s tender and mournful facial expression testifies to both primal motherly love and intuitive knowledge of Jesus’ future. The figure group expresses love, joy, security and melancholia all at once. 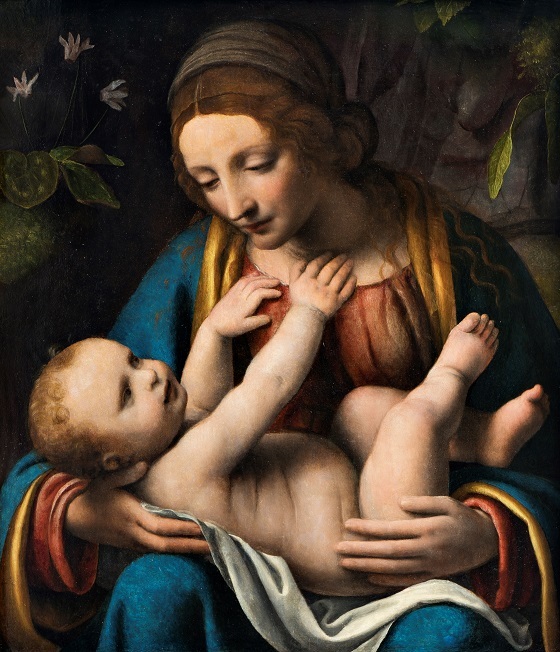 The soft light, the sfumato technique and the rocky background reveal the influence of Leonardo da Vinci, who was active one generation before in Milan during. The Virgin Mary’s facial features with the almond-shaped eyes, straight nose and small, tender mouth are highly reminiscent of Leonardo’s female types. The relation between mother and child is intimate and infused with something both sweet and natural. Luini has come to be known as an exemplar of the Lombardian High Renaissance. His works are clearly inspired by Leonardo da Vinci’s figures and composition schemes, his chiaroscuro technique and, not least, his sfumato – a way of graduating light and shadow contrasts that makes contours and facial features appear soft and downy. Luini carried out both oil painting and fresco decorations, all with religious subjects, and he has become particularly known for his graceful and mild female figures.